Super clever pants for potty training kids. Just like normal cotton pants with an added absorbent and waterproof cow print panel in the middle. Great for catching accidents, organic bamboo is super absorbent and the PUL waterproof backed organic cotton will keep their clothes dry. 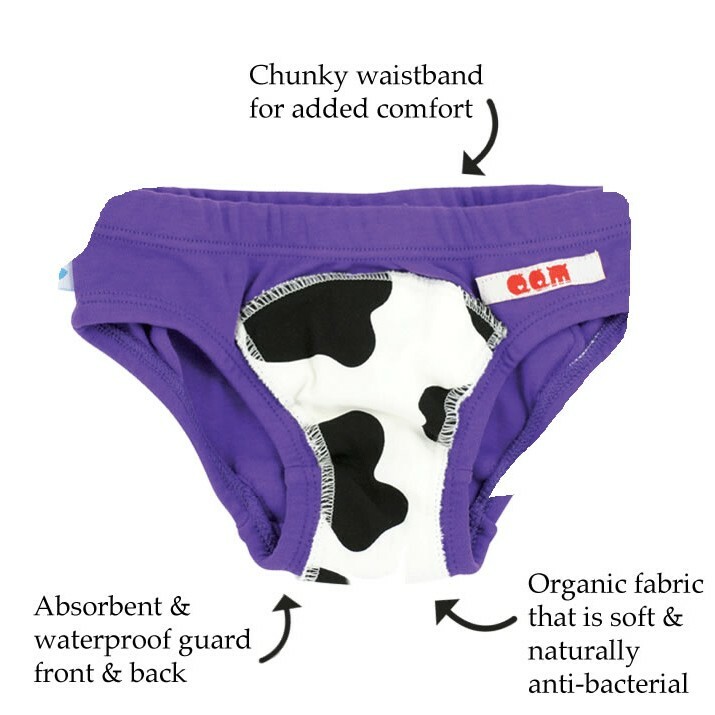 These pants feel just like normal pants which helps with potty training and young children just love the fun cow design. Machine wash and re-use, you can put them in the tumble dryer too. Less waste and cost that plastic disposable training pants. Bamboo fabric is naturally anti-bacterial and kind to skin. If your child does a wee they can feel the wetness of the bamboo fabric which further helps potty training. Made with "Dribble Bubbs" fabric by Quack Quack Moo. Organic cotton cowprint, breathable waterproof layer topped of with soft and absorbent organic bamboo.